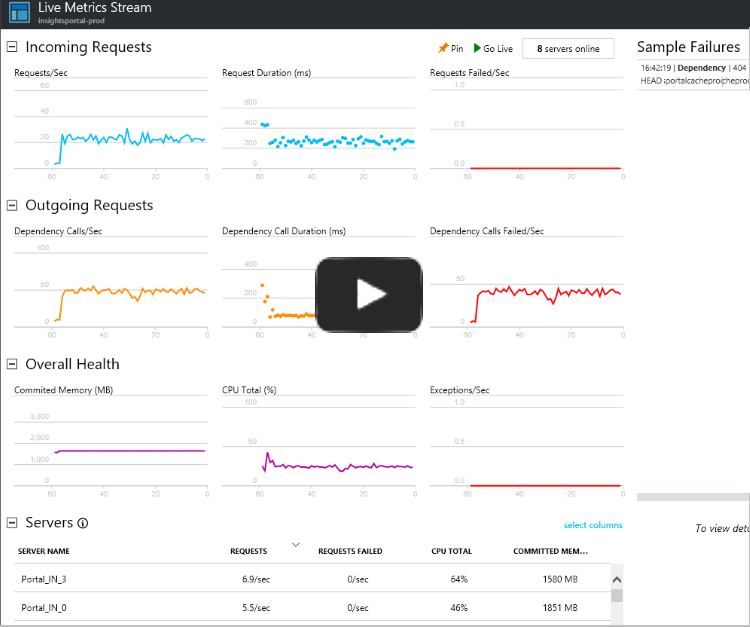 Probe the beating heart of your live, in-production web application by using Live Metrics Stream from Application Insights. Select and filter metrics and performance counters to watch in real time, without any disturbance to your service. Inspect stack traces from sample failed requests and exceptions. Together with Profiler, Snapshot debugger, and performance testing, Live Metrics Stream provides a powerful and non-invasive diagnostic tool for your live web site. Validate a fix while it is released, by watching performance and failure counts. Watch the effect of test loads, and diagnose issues live. Focus on particular test sessions or filter out known issues, by selecting and filtering the metrics you want to watch. Get exception traces as they happen. Experiment with filters to find the most relevant KPIs. Monitor any Windows performance counter live. Easily identify a server that is having issues, and filter all the KPI/live feed to just that server. Live Metrics are currently supported for ASP.NET, ASP.NET Core, Azure Functions, Java, and Node.js apps. If you haven't yet install Application Insights in your web app, do that now. 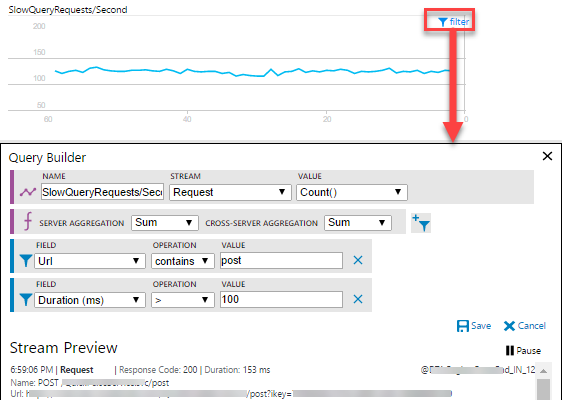 In addition to the standard Application Insights packages Microsoft.ApplicationInsights.PerfCounterCollector is required to enable Live Metrics stream. Update to the latest version of the Application Insights package. In Visual Studio, right-click your project and choose Manage Nuget packages. Open the Updates tab, and select all the Microsoft.ApplicationInsights. * packages. In the Azure portal, open the Application Insights resource for your app, and then open Live Stream. Secure the control channel if you might use sensitive data such as customer names in your filters. Check the outgoing ports for Live Metrics Stream are open in the firewall of your servers. How does Live Metrics Stream differ from Metrics Explorer and Analytics? You can monitor custom KPI live by applying arbitrary filters on any Application Insights telemetry from the portal. Click the filter control that shows when you mouse-over any of the charts. The following chart is plotting a custom Request count KPI with filters on URL and Duration attributes. Validate your filters with the Stream Preview section that shows a live feed of telemetry that matches the criteria you have specified at any point in time. In addition to Application Insights telemetry, you can also monitor any Windows performance counter by selecting that from the stream options, and providing the name of the performance counter. Live metrics are aggregated at two points: locally on each server, and then across all servers. You can change the default at either by selecting other options in the respective drop-downs. By default, the live feed of events shows samples of failed requests and dependency calls, exceptions, events, and traces. Click the filter icon to see the applied criteria at any point in time. As with metrics, you can specify any arbitrary criteria to any of the Application Insights telemetry types. 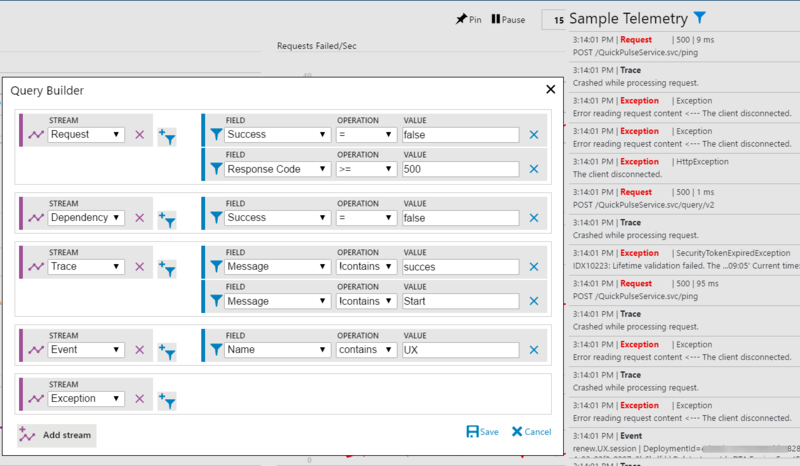 In this example, we are selecting specific request failures, traces, and events. We are also selecting all exceptions and dependency failures. Note: Currently, for Exception message-based criteria, use the outermost exception message. 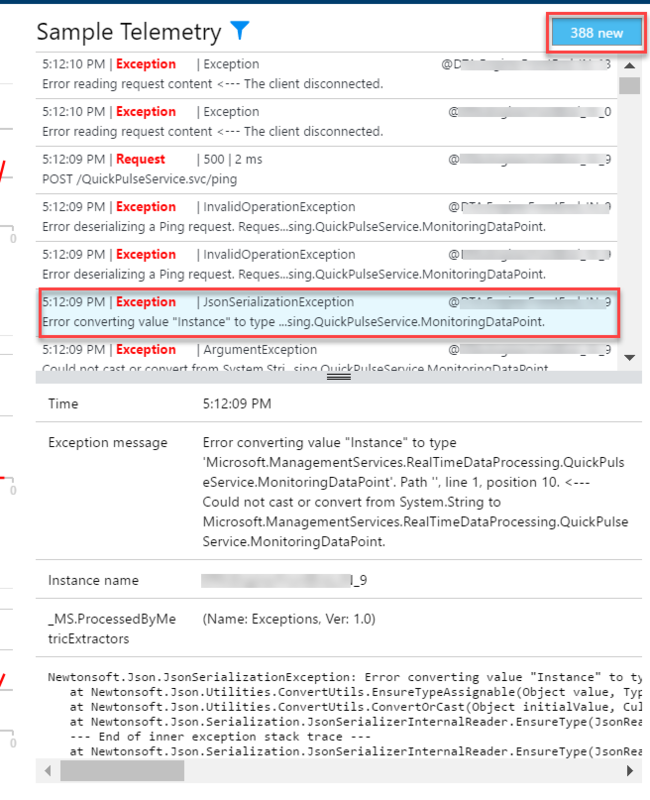 In the preceding example, to filter out the benign exception with inner exception message (follows the "<--" delimiter) "The client disconnected." use a message not-contains "Error reading request content" criteria. See the details of an item in the live feed by clicking it. You can pause the feed either by clicking Pause or simply scrolling down, or clicking an item. Live feed will resume after you scroll back to the top, or by clicking the counter of items collected while it was paused. 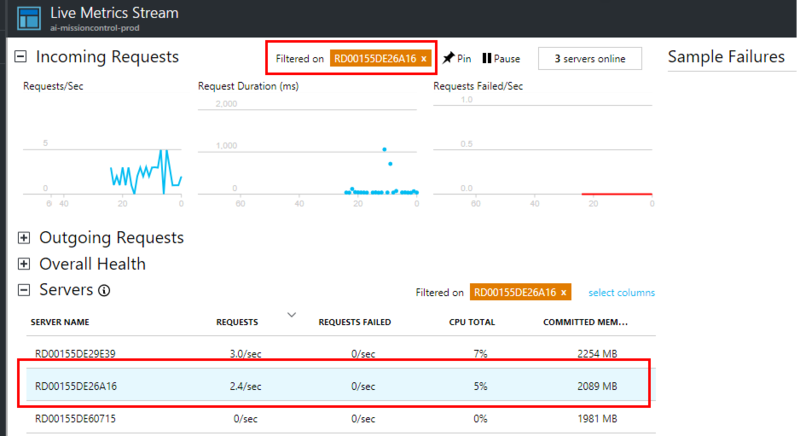 If you want to monitor a particular server role instance, you can filter by server. Custom Live Metrics Stream is available with version 2.4.0-beta2 or newer of Application Insights SDK for web. Remember to select "Include Prerelease" option from NuGet package manager. The custom filters criteria you specify are sent back to the Live Metrics component in the Application Insights SDK. The filters could potentially contain sensitive information such as customerIDs. You can make the channel secure with a secret API key in addition to the instrumentation key. For Azure Function Apps (v2) securing the channel with an API key can be accomplished with an environment variable. Create an API key from within your Application Insights resource and go to Application Settings for your Function App. 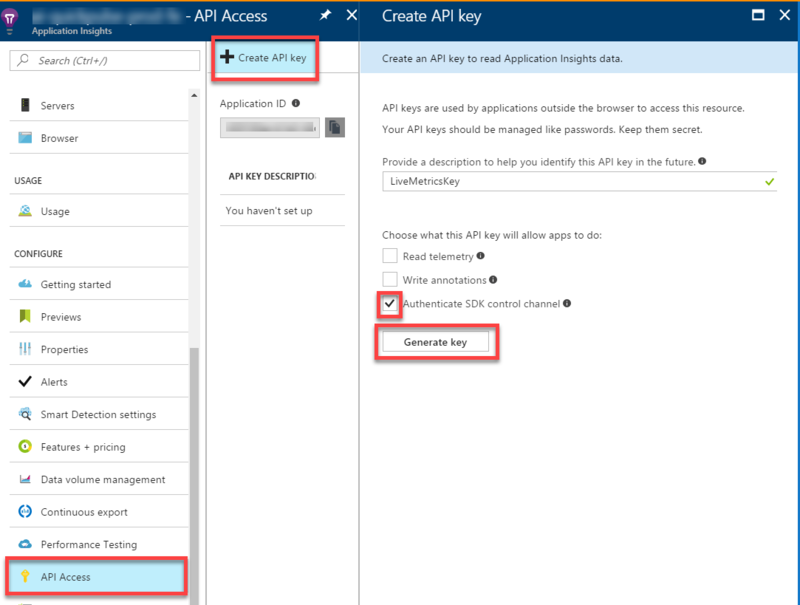 Select add new setting and enter a name of APPINSIGHTS_QUICKPULSEAUTHAPIKEY and a value that corresponds to your API key. However, if you recognize and trust all the connected servers, you can try the custom filters without the authenticated channel. This option is available for six months. This override is required once every new session, or when a new server comes online. We strongly recommend that you set up the authenticated channel before entering potentially sensitive information like CustomerID in the filter criteria. If you want to watch the effect of a load increase, use the Performance Test blade. It simulates requests from a number of simultaneous users. It can run either "manual tests" (ping tests) of a single URL, or it can run a multi-step web performance test that you upload (in the same way as an availability test). After you create the performance test, open the test and the Live Stream blade in separate windows. You can see when the queued performance test starts, and watch live stream at the same time. No data? If your application is in a protected network: Live Metrics Stream uses a different IP addresses than other Application Insights telemetry. Make sure those IP addresses are open in your firewall.